Any Custom metal headjoint (standard on Custom and Conservatory flutes) purchased directly from Powell Flutes can be exchanged for another headjoint for up to one year from the date of purchase, provided the returned headjoint is in good repair and has not been altered to fit your flute. The customer does have the option to exchange their original headjoint for another of greater value but is responsible for the difference in cost. The warranty is restricted to the original owner only. An owner desiring to make a headjoint exchange will be billed for postage for each trial shipment. Powell reserves the right to limit trial headjoint shipments to three shipments of one headjoint each within the year. If you purchased your Custom or Conservatory flute or headjoint from an authorized Powell Dealer, any exchange warranty must be handled through the original dealer. This warranty is only offered if the returned headjoint is in good repair, and has not been altered to fit your flute. The warranty is restricted to the original owner only. The headjoint exchange warranty is good for any flutes purchased directly from Powell. If you purchase a Powell flute from one of our authorized dealers, you'll want to check with them and make sure they offer the exchange warranty. We recently met with our Custom Service Manager, Rebecca Eckles, to disuss headjoint fit as part of this policy -- especially if the headjoint is too small. 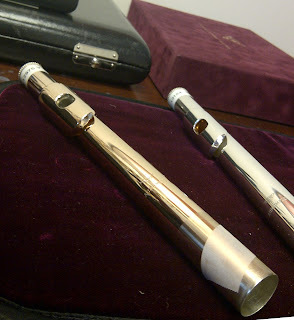 So, imagine this scenario: You purchase a Powell Custom or Conservatory flute, and the headjoint you choose is a bit too small. You have a year to decide whether you want to keep it or exchange it, but if you have any sizing done (making it larger in this case), it would void the warranty. So, what can you do to keep the headjoint in tact? You could use tape on the tenon, and there are several choices (scotch tape, Teflon tape, masking tape). There are even copper strips available (we found some at J.L. Smith - http://www.jlsmithco.com/New-Products/COPPER-HJ-FITTING-STRIPS). Tape is definitely a good option to keep the headjoint viable should you choose to exchange it later. If you do decide to ultimately go with one that is slightly too small (whether the one you originally chose or something different you've gotten in exchange), there are a couple of options you have. You could continue to use tape as noted above. There is also an option of having the headjoint tenon "plated up" to the desired thickness. This process creates a "sleeve" of additional plating on the tenon to get a better fit. You could also get a different barrel -- but you will certainly need to check with our repair department on this and the plating "sleeve" as well. It's always best to check with our repair department if you have questions. They are happy to help! To read more about the full warranty on our flutes, visit https://www.powellflutes.com/repair-doctor/warranty.